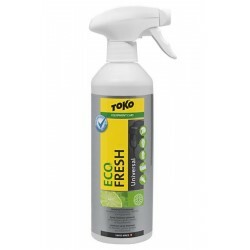 Free your wear and accessory effectivly and gently from bacteria with the antibacterial spray of Toko. Being a hygienic product, this spray is a must for every sportsman. This product is certified and freem from harmful additives. It ensures a lasting fragrance for helmets, gloves, textiles, and equipment.